Kill an enemy to make them your teammate! This is the new version of my surf booster.Read Description! New color menu that runs through Es_Tools. :D +Woot if you like. 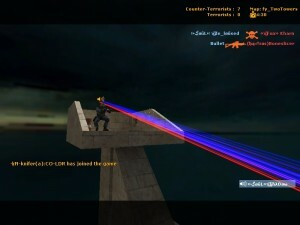 Script de Deathmatch avec Plusieurs mods Fun ! Hello, graduating class of 2010. You have been selected as the lucky class to participate in this year's Battle Royale. At the start of each round you will be given a random weapon. There is only one objective: SURVIVE. Simple download manager with 3 edition! Updated! Egyszerű letöltéskezelő 3 változattal! Frissítve! Magyar nyelven is! This auto-respawn works 100%. That makes it is that when entering to a team or when they kill you then you resuscitate instantly. // Este auto-respawn funcion al 100%. Hace que al morir o que cuando entras a un equipo revives instantaneamente. 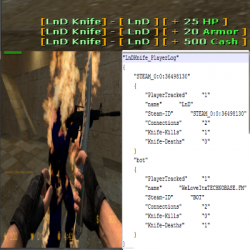 LnD Knife is a Full-Featured Knife Addon, you can set the HP, ARMOR and CASH Which a Player gain if he Kills someone with a Knife, u can set if A Player will be burned or freezed if hitted by a Knife, and A Knife-Only Mod is included too!